After a positive and negative experience at Auberge du Pommier a couple years back, a return visit was in order to see if the exemplary service continues. Glancing into the private event room at the entrance, there wasn’t an occasion on the Friday night visit, good news for us already. We were greeted promptly at the door and shown to the table right away. Service was attentive and unhurried, what you’d imagine a fine dining restaurant to exude. With spring came a lighter menu. 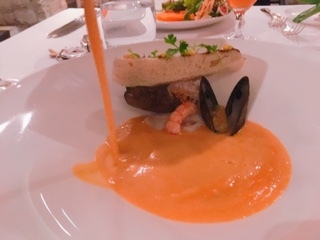 The poured-at-table bouillabaisse ($24) was thick and silky, with an ingenious addition of crispy ginger for an expected zip. The actual seafood was surprisingly scant but well prepared: pieces of barely cooked Fogo Island cod, sweet flakes of crab, delicate mussels, and a couple of sweet petite shrimp. The piece of toasted pita with saffron aioli on top was a tad dry, I just stuck with the delicious baguettes that arrive with the bread basket instead. 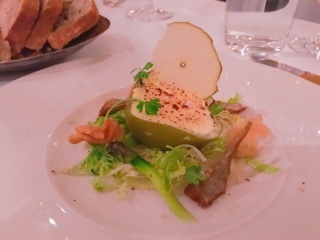 For those who like cheese and fruit combinations, the camembert royale ($22) is an interesting appetizer - half a baked apple stuffed with a creamy camembert custard gives the dish a sweet, savoury, and tart combination. Adorned with asparagus, artichokes and black truffle, the starter has a light but rich quality. While the homard thermidor ($55) was barbecued, the lobster wasn’t overly smoky. Additionally, despite incorporating a variety of aromatic ingredients such as leeks, morels, Dijon Mornay and hollandaise, it didn’t feel overdone and you could still taste the plump crustacean. Typically, this dish is part of their tasting menu, but you’re advised every dish can also be ordered a la carte. 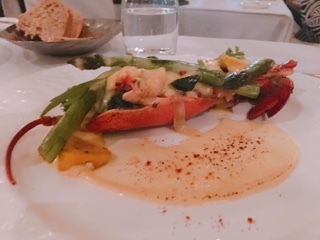 In this instance, Auberge should consider augmenting the sides as the lobster really didn’t feel like a main with the meagre spears of asparagus and cubes of potato. The fletan ($45), part of their a la carte menu, was a more fulsome dish. The butter-poached halibut was a hefty portion and cooked wonderfully so it remained moist and meaty. 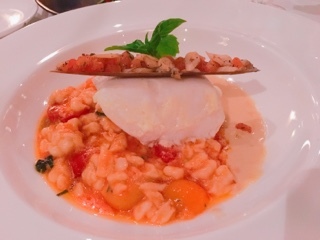 Aside from the fish there were so many other elements: a beautiful garlicky razor clam; a tasty but overcooked tomato spätzle that went surprisingly well with everything; and a buttery gasconne sauce that paired wonderfully with the fish. 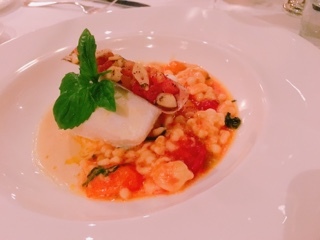 All the flavours were great with the halibut, which is normally such a neutral fish. 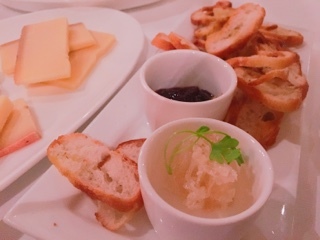 None of the desserts were enticing so we stuck with the tried and true cheese course, which arrives with plenty of crostini, a berry compote, and cube of sweet sticky honeycomb. 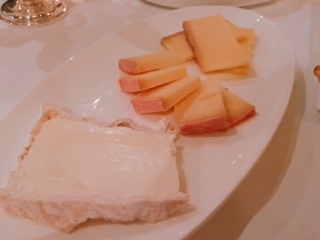 Choosing three French cheeses ($18), the selection had various firmness for interest: a soft Brillat-Savarin, a triple cream cow's milk cheese from Normandy that simply melted on the tongue; a semi-hard abondance that's stronger, but still not overpowering from Haute-Savoie; and the firmer comté that has an interesting almost spicy finish to it. The generous portions of each were perfect for sharing amongst two. The petit four selection, arriving with the bill, is such a satisfying finish. 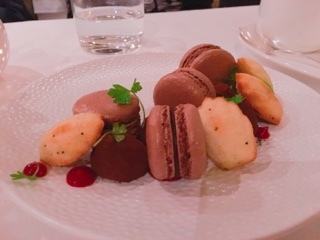 The soft and fudgy chocolate macaron was delicious, the lemon poppy seed madeleine decent, and a chocolate truffle with a crisp shell that breaks a part to release a whipped ganache with the consistency of butter cream frosting. Tasty to the last bite. I’m glad to see Auberge’s service level hasn’t faltered. In fact, staff were so friendly that I couldn’t help but watch interactions between a waiter and table of three older women beside us. As they were having difficulties reading the menus in the dim lighting, being tech savvy they took out their phones and shone the screens on the menu. Seeing this, the waiter introduced them to the flashlight function, much to their delight. He took the time to show each of them how to use it and later when they stopped him again, he helped them navigate to the light once again. A great above and beyond example, demonstrating why Auberge continues to impress.